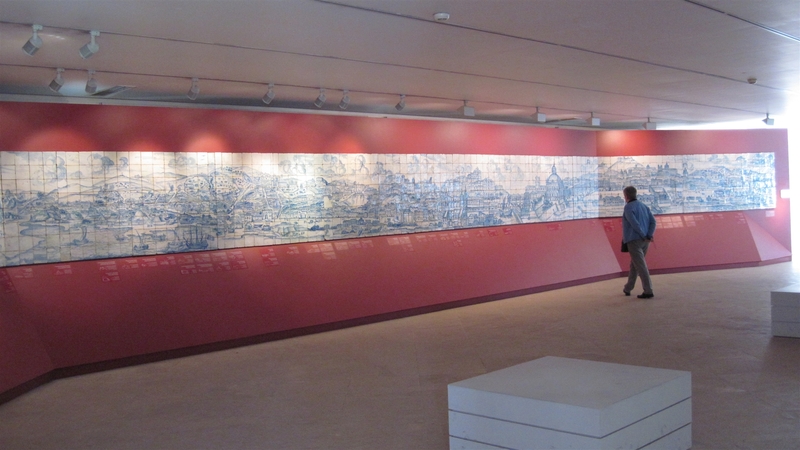 Today we visited the Museo Nacional do Azulejo (the National Tile Museum). 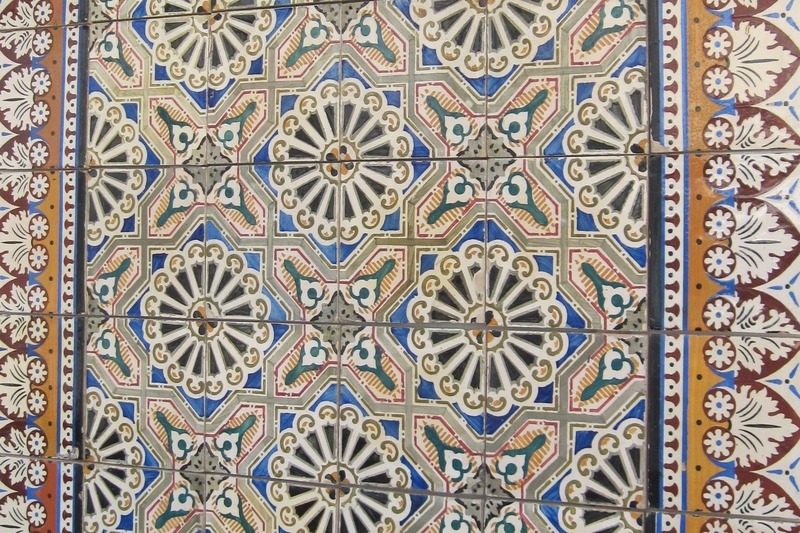 For those of you who have not seen photos of Lisbon, many of the buildings in the city are covered in decorative tiles. 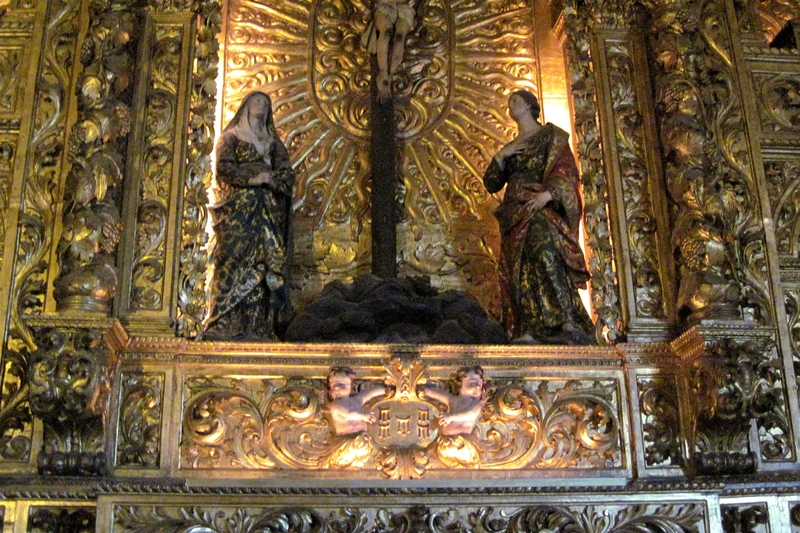 They are absolutely gorgeous, and the Museo absolutely did them proud. When we looked up the directions to the museum, we were instructed to take a 25-minute subway ride from our local station, and then to walk 10 minutes or so to the museum. I am on a fitness mission for the trip, so I decided we should just walk straight there. I’m glad I did – it was less than two miles away and took hardly any time at all. It was in the right direction, too: our street shoots straight uphill from the train station, but the street perpendicular to us (which runs parallel to the tracks) follows the river and is pretty flat, especially for Lisbon, and that’s the street we needed to follow. As we approached the tile museum, we thought it looked a bit odd. The building appeared to be an old church, but the doors were bolted shut and there was graffiti on the white walls. It looked deserted, frankly. We turned a corner at the opposite end of the building, saw a lovely courtyard, and went inside. We are so glad we did. Quinland, especially, absolutely loved it. She was so excited, she was gesturing with her hands as she talked, getting more and more animated with every new room we entered. It really was fabulous. The building we saw from the outside was a church, part of a convent that was now converted to a museum. Entering the building through the courtyard, you enter a cloister; two sides of the cloister are closed off to the public, but you can see that they are filled with tiles being sorted, inventoried, and cleaned up. 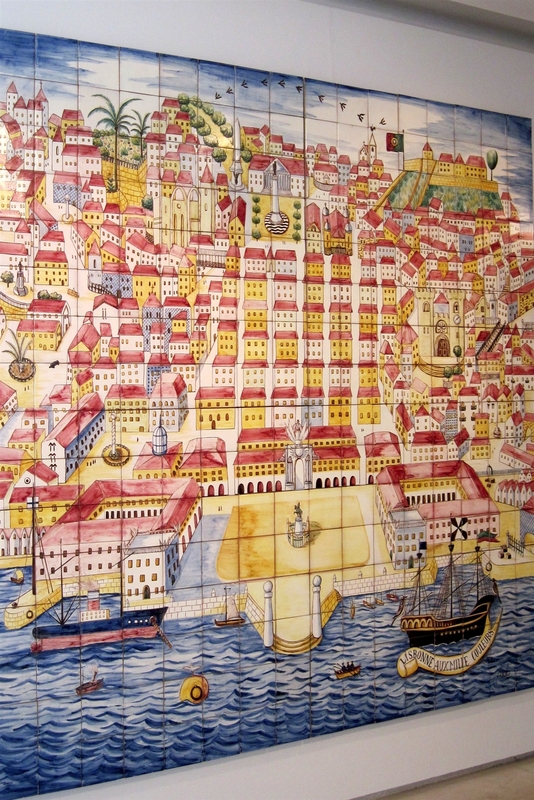 The other two sides are flanked with rooms, each featuring a particular style of azulejo or a particular decorating technique. 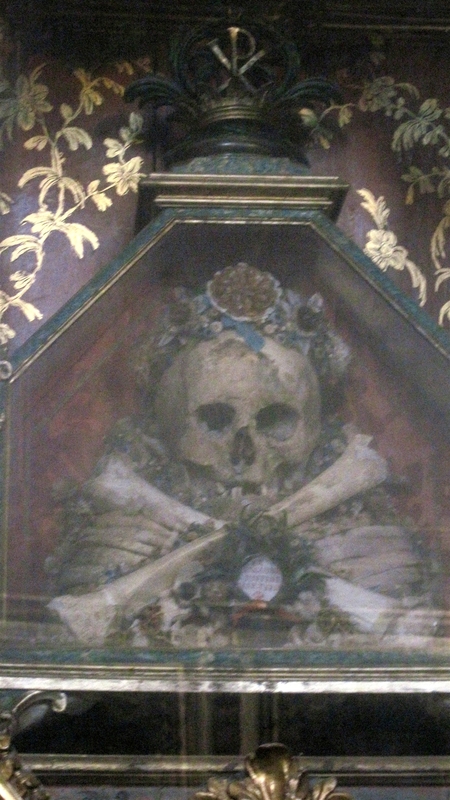 You can also view the chapel, where the gilt decor, paintings everywhere, and skull-and-crossbones relics were a revelation for Q. 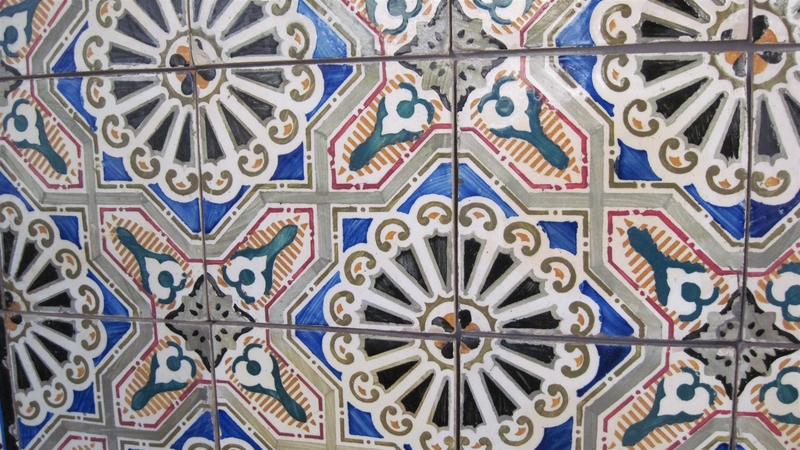 The tiles dated back to the early 1500’s, and the exhibits detailed the processes used to make and decorate the tiles, then and now. 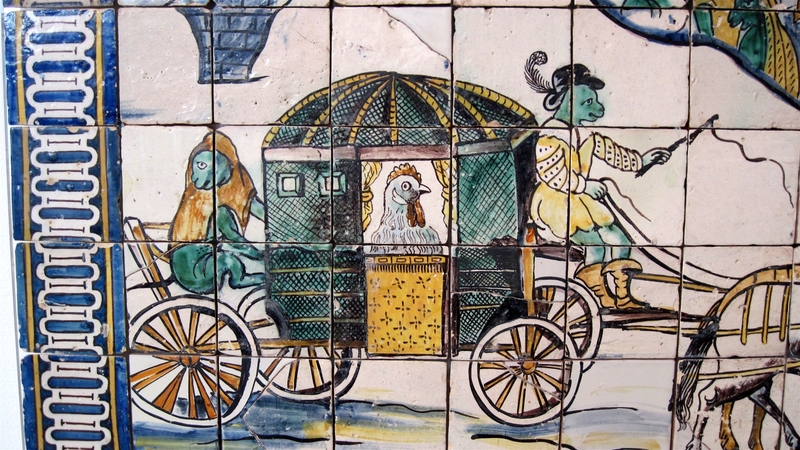 The first tiles were the most interesting to us; they featured interlocking patterns and designs as opposed to the later styles, which would portray an entire scene, such as The Chicken’s Wedding. 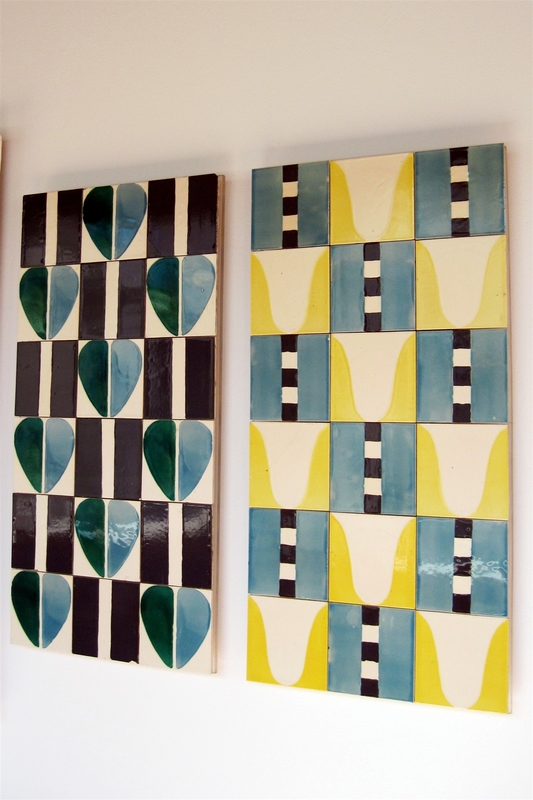 The very latest tiles (20th century on) went back to the abstract designs and were also a big hit with us. 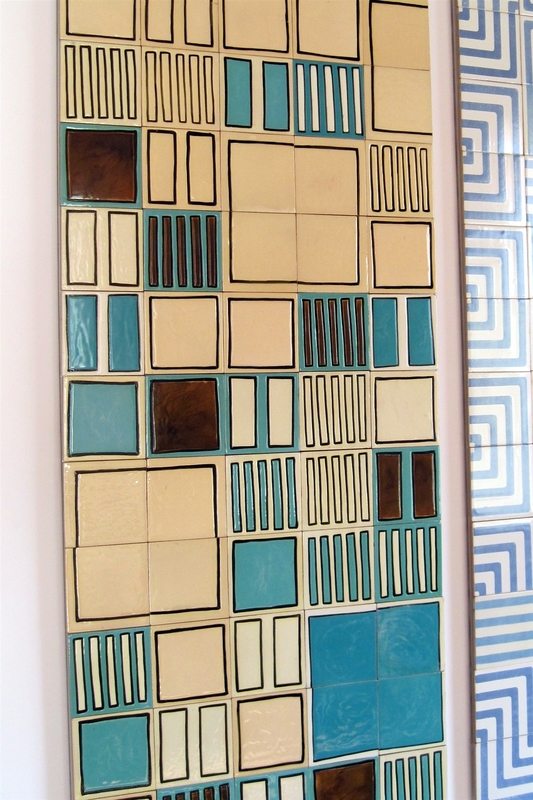 Quinland’s refrain: “I’d have that in my room!” I think we are going to each design a set of tiles and go make them at Paint Pots in Hillsdale when we get home. I was also glad that Quinland loved the museum for another reason: we were planning to see the Hunger Games movie afterward, and the suspense would have been terrible otherwise! She and I went straight from the museum to the train station and caught the Metro up to Campo Pequeno, where we knew it was playing. We then got turned around looking for the theater before a lovely lady passing by let us know that it was underground. Even with that knowledge, we almost asked someone else for directions when we were within 50 feet of it! We had no idea when the movie was playing (yeah, this spontaneous, play-it-by-ear thing is pretty typical and would horrify some of my closest friends), but figured we could kill time if needed. We got there only 45 minutes before the next showing, then waited anxiously for the previous show to get out and for them to clean the theater. (We only tried to get in twice before they were ready, and they were pretty nice about it.) Needless to say, we were the first ones sitting in the auditorium. The first of twenty, mind you. Those of you at home who saw The Hunger Games on opening weekend had lines. Fans. Mayhem. (I only know what I read online, but hey, the third biggest opening weekend ever? Best ever for a non-sequel? Best ever outside of summer?) Here? Not so much. Besides Q and I, there was a group of seven Portuguese girls, some other Americans chattering excitedly beside us, and a few solo stragglers. Fine by me! I was excited enough. I don't have a photo of us at the Hunger Games movie, so this will have to represent our excitement. 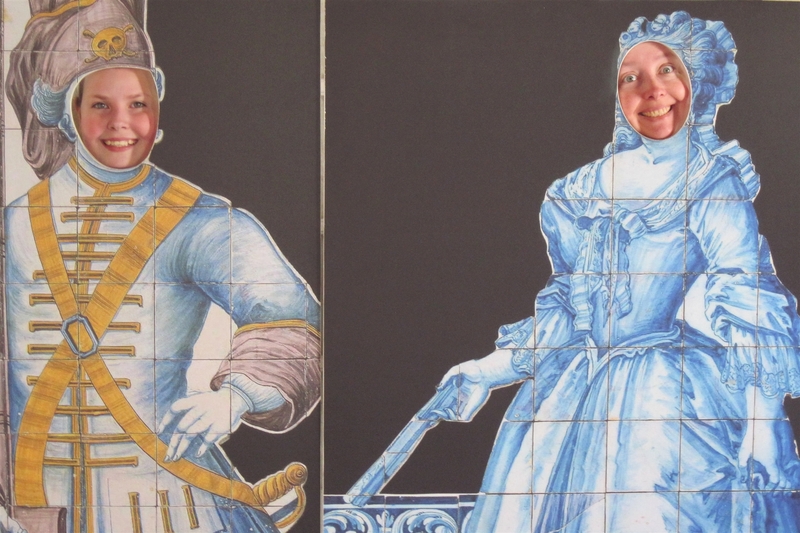 Q and I saw the cheesiest head-thing ever at the azulejo museum and had to have our picture taken with it. David was appalled. My short review: I loved it. I cried at the Reaping, I cried when Katniss started singing to Rue… I haven’t cried so much in a movie in ages. It was different from the books, but I was ready for that. Quinland was far more critical. 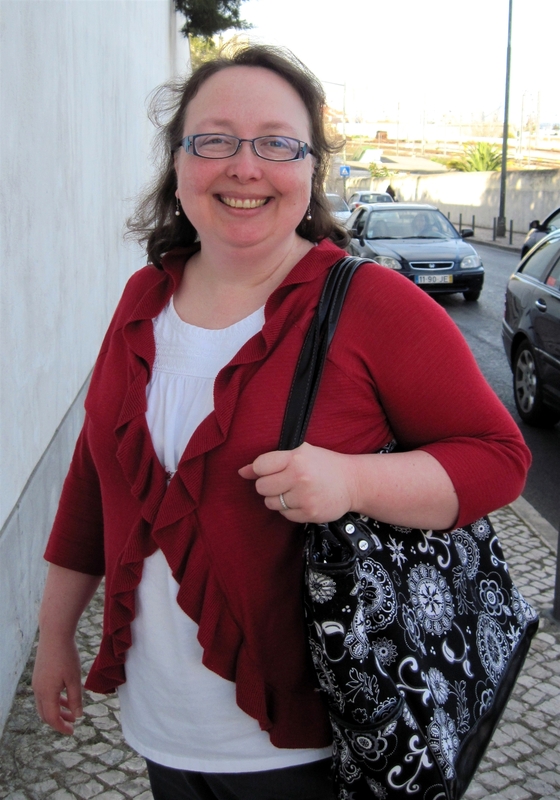 She had re-read the book recently in class, and so was far more attuned to what was missing or changed in the script. Her Facebook quotes: “A bit disappointing, but worth seeing.” and “The movie was ok for a movie, but wasn’t nearly as good as the book.” That’s true. As I mentioned when I read the book back in September, I could not put it down. We hit the mall food court on the way out, where I had the best sandwich ever. Okay, the second-best, since nothing beats my signature curry chicken salad sandwich from New Seasons, but since they made it a “seasonal” chicken salad, I can rarely get it. But I digress, as I so often do. This one was fresh mozzarella, tomato and pesto on rustic bread, grilled… yum. Home on the subway to a worried David (this no-cellphone thing has everyone a bit on edge), where I finally slammed up three blog posts I had been working on. I have so many in the hopper at any given time, just waiting until I get the chance to add photos and finish them off. Expenditures: Entrance to the azulejo museum and sandwiches in the cafe; a mini azulejo magnet and two postcards; more money on my subway zapper card; movie tickets and candy (19 euros – ouch); dinner at the food court of joy, where there were many healthy/fresh choices. Experiences: First European museum visit and first view of relics for Q; first refrigerator magnet souvenir (I want one from each country so I can see them every day when I get home); first European movie experience for Q (mine, of course, began way back with Princess Bride matinees in Dublin). I think I’ll make grilled fresh mozzarella, tomato and pesto on rustic bread sandwiches tonight in your honor! I’m so glad you’re having fun. Maude saw it at a midnight show. Yours looks so much better! Awesome museum and yummy sandwich!